I've loved broccoli soup since I was little. Whenever my family would go to Coco's, I would always order this favorite soup. I haven't had it in awhile, but I think I've got to try this recipe. It has bacon in it. Enough said. Oh, and cheddar baguettes. Yum. Cook the bacon in the butter in a medium saucepan over low heat until it renders slightly, about 2 minutes. Add the onion, garlic and celery seed and cook until soft, about 4 minutes. Scatter the flour over the mixture and stir to coat. Gradually add the broth and the milk, whisking until smooth. Add the potatoes and sliced broccoli stem; increase the heat to medium and simmer, covered, until slightly softened, about 5 minutes. Add the broccoli florets and season with 1/2 teaspoon salt. Continue cooking, uncovered, at a rapid simmer until the vegetables are tender, about 5 minutes; season with salt and pepper. Meanwhile, position a rack in the upper part of the oven and preheat the broiler to high. Spread the mustard on each piece of baguette and top with a cheddar slice. 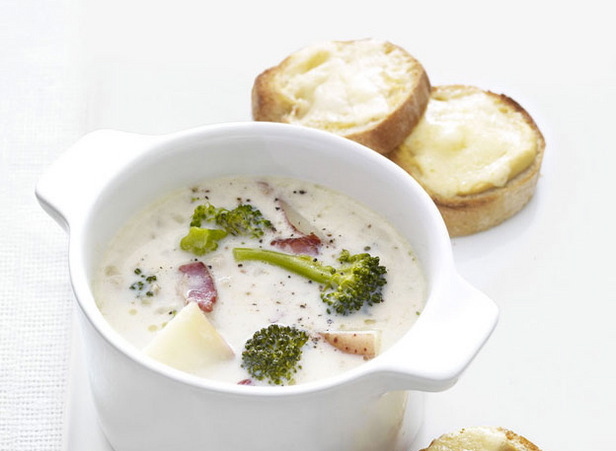 Place on a baking sheet and broil until the cheese melts; serve with the soup.